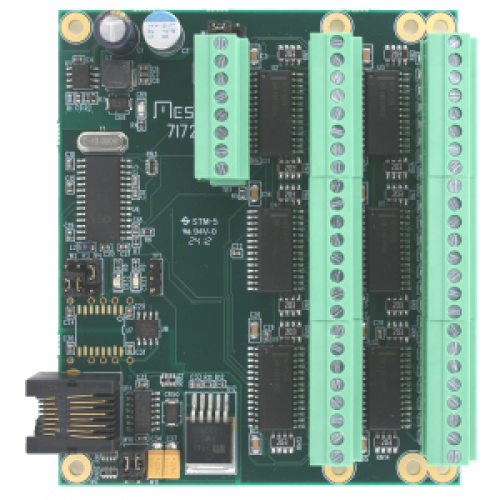 The 7I72 is a remote isolated 48 output card. The 48 outputs are 5VDC to 28VDC sinking drivers (common + field power) with 300 mA maximum current capability. All outputs have LED status indicators. Outputs have per output short circuit protection, overvoltage clamps and per driver chip thermal shutdown. 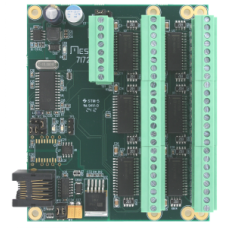 The 7I72's outputs are suitable for driving relays, contactors, solenoids, and other medium power inductive or resistive loads. The outputs and field power are galvanically isolated from the communications link. The RS-422 interface at 2.5 MBaud is compatible with HostMot2s SSLBP smart serial interface which can support as many as 32 7I72 cards for a total of 1536 outputs with real time update rates up to 10 KHz. 3.5 mm screw pluggable screw terminals are used for all isolated I/O.